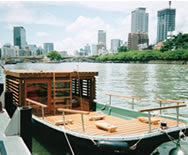 HOSTEL 64 Osaka : staff blog: Osaka Nice and Cozy Cruising boat! Osaka Nice and Cozy Cruising boat! Ofune Kamome is a unique cruising boat which is operated by a nice couple. It is like a cozy house but in a floating river. You can have your feet up the open wood deck and enjoy a breath of air from the river. And also can have a tea in the room on deck with relaxing time. The Kamome trip to Yodo river, Nakanoshima and Dotonbori such as the nice Osaka place. For booking the boat, Ask the front desk at Hostel 64 Osaka!